Eagles are one of the most majestic creatures to witness. They soar through the sky proudly & they move in a swift manner. They easily capture ones attention. Nature and wildlife are so captivating. The Artist, Nicole Heitzman, enjoys wildlife of all arrays, but particularly enjoys watching eagles & elk. If you look closely, you will notice a herd of elk in the background of the painting. 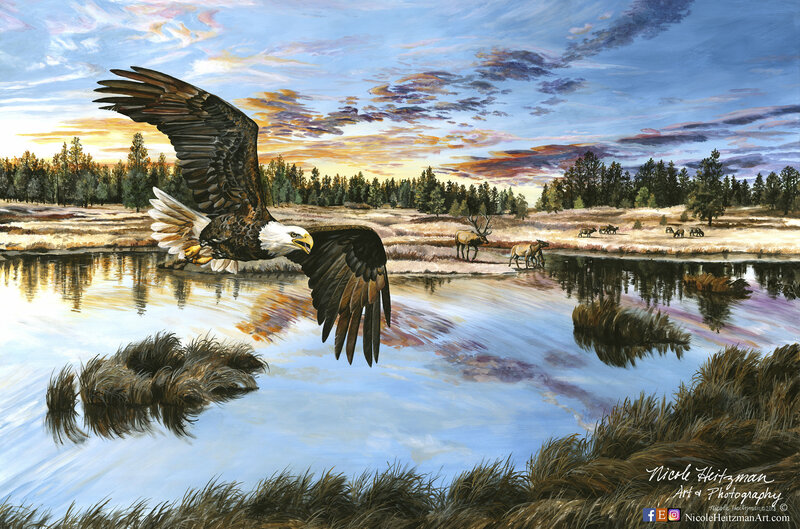 She titled this painting, "Boundless Territory" since the scene could go on forever in which the Eagle could soar endlessly. It also represents the patriotic and heartfelt vision of freedom. Nature has infinite beauty to offer and Nicole wanted to capture a portion of that boundless freedom in this piece of fine art. This artwork is an unframed Canvas Giclee print that is 36" wide by 24" high. This edition is small and consists of only 200 signed and numbered prints. Customization in framing and other sizes are available. (Please inquire).